Meats have traditionally been roasted at relatively high temperatures, ranging from a moderate 350 degrees Fahrenheit, to well over 400 F for especially small or tender cuts such as pork tenderloins. Tougher and fattier cuts, such as the shoulder, benefit from long and slower cooking at relatively low temperatures. It takes all day, but a pork roast cooked at 250 F will come out exceptionally tender. 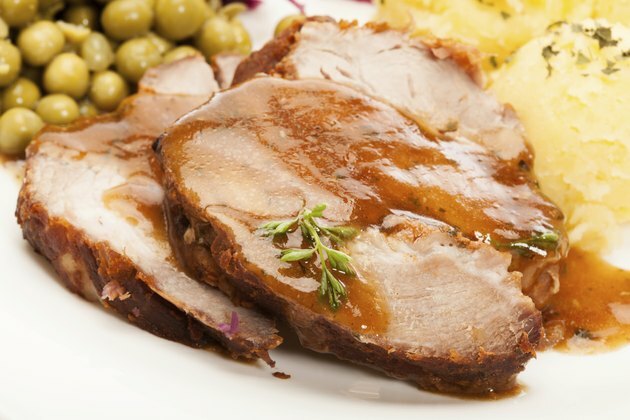 Dry your pork roast with paper towels, wiping the cut ends of the bones to remove any fragments that might cling to them. With a sharp knife, carefully score the outer covering of fat into a cross-hatch pattern. Make shallow cuts only partway into the fat, taking care not to pierce the underlying muscle. Rub salt and pepper or other seasonings over the roast's exposed surfaces. If you're using a spice rub or spice blend, covering and refrigerating the roast overnight will give the flavors time to infuse into the meat. Preheat your oven to 250 F, and transfer the seasoned roast to the rack of your roasting pan. Slide the pan of pork onto the middle rack of your oven. Slow-cook your pork for 4 to 8 hours, depending on the cut and the size of the roast, until you can easily slide a fork into it and twist off a fragrant mouthful of pork. It should be completely tender, but still moist. Remove the roast from your oven. If you'd like to crisp the skin or outer layer of the roast, increase the heat to 500 F, and slide the roast back into the oven for 5 to 10 minutes until it's very brown and slightly blistered. Let the pork rest for 10 to 15 minutes before you slice or shred it. The slow-roasting method requires a relatively rich and fatty cut, such as the pork shoulder, fresh ham or pork belly. Much of the fat renders out during this long, slow cooking process, and any large seams of fat and connective tissue can be removed when the pork is shredded or sliced.